Seating for auditoriums, theaters, education, sport, entertainment and other. Fixed and flexible seating solution for various venues. We’ll maximise your space finding the best seating solution! 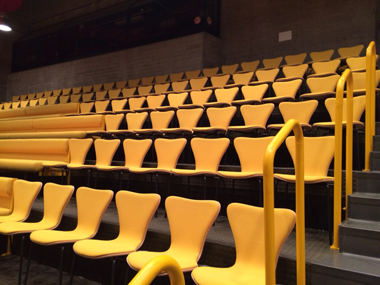 At Auditorium SC we strive to meet your specific needs in implementation seating solutions for theaters, congress centers, concert and lecture halls, sport arenas, churches and other auditoriums. We are specialists for fixed seats and also movable seating systems. 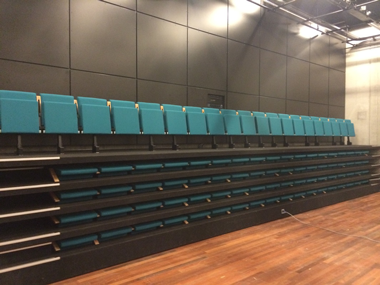 We produce a modular series of fixed audience seating for many different auditoriums as theaters, lecture halls, school auditoriums, churches, sport arenas and others. Our retractable seating system is designed to be efficiently closed away and provide a multipurpose space. Platform is available with a range of folding chairs and benches. 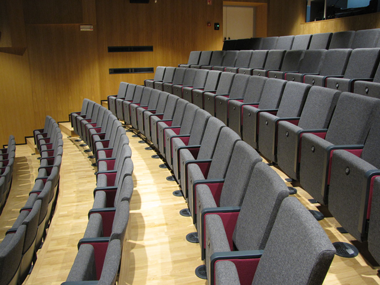 We have a wealth of experience with auditorium seating renovations. Our excellent experts are capable of the most demanding upholstery challenges. Our mission is understanding all of the customer needs and integrate them in the final product. We deal with design, engineering and producing chairs for different venues. With our flexibility we can challenge all client’s demands. Together with our trusted partners we are present on markets of Scandinavia, Benelux, Germany, Austria, Croatia, Montenegro, Japan and many others.